Whoever thought the world would love the most unlikely pairing of a pig and a frog? I bet no one did. But Miss Piggy and Kermit succeeded in just that, capturing the hearts of many people and having a dedicated following that continues to root for them. You can just imagine the devastation it brought out when they finally called it quits last 2015. Miss Piggy and Kermit are puppets who look like their animal counterparts. But Miss Piggy has beautiful blonde hair and loves dressing up fancily, while Kermit looks like long, gangly green frog. Here’s everything you need to look like Miss Piggy and Kermit. 1 Sparkly Pink Dress Miss Piggy is the definition of girly. A sparkling pink dress would definitely be something she’ll love to wear. 2 Pink Heels Rarely do we see Miss Piggy’s feet but she’ll definitely be wearing something very feminine like this pair of pink heels. 3 Pearl Necklace Miss Piggy loves accessorizing and what’s more timelessly classic than a pearl necklace, right? 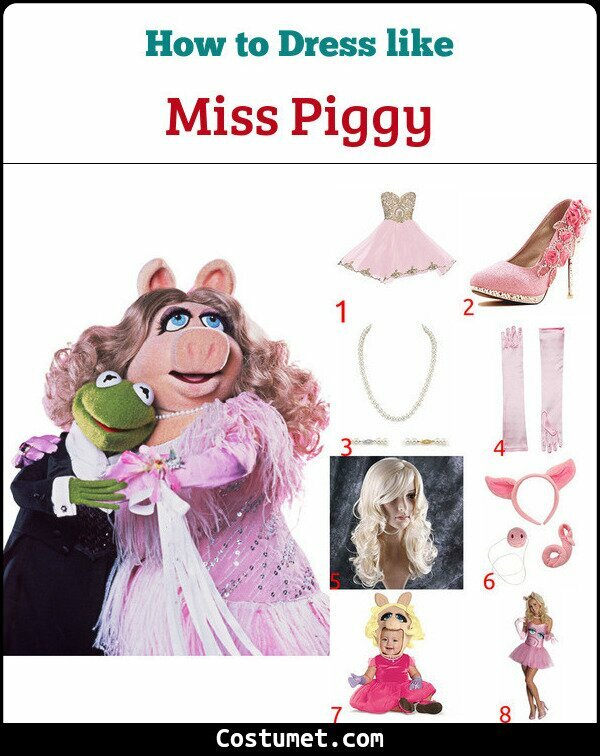 4 Long Pink Satin Gloves Miss Piggy is also known for wearing long sating gloves, so don’t forget your pait. 5 Blonde Wig Unlike many other pigs, Miss Piggy has beautiful long blonder hair. 6 Pig Ears and Nose Your Miss Piggy costume can’t be completed without a pig ears headband and nose. 7 Miss Piggy Baby Costume Dress your baby up as little Miss Piggy with this costume set. 8 Miss Piggy Costume Set If you want something more obviously themed, this Miss Piggy costume set is perfect. 1 Black Three-Piece Suit Kermit doesn’t usually dress up but when he does, he goes all out in a classic black three-piece suit. 2 White Dress Shirt Kermit wears a white dress shirt underneath his vest. 3 Black Bowtie Instead of a necktie, Kermit prefers a bowtie. 4 Green Oxfords Stay in theme with a pair of green Oxfords. 5 Frog Head and Hands Wear a frog head and gloves to complete your Kermit outfit. 6 Kermit Baby Costume Dress up your baby as Kermit the Frog. 7 Kermit Costume Set If you don’t want to spend a long time with DIY-ing your costume, buy a full set. Miss Piggy and Kermit have had many voice actors throughout their careers. But the most recent ones are Eric Jacobson for Miss Piggy and Matt Vogel for Kermit.